Apple's next-generation APFS has made its way to macOS High Sierra after an official debut on iOS 10.3, and with it comes essentially instant file copies, better efficiency for greater overall speed, and fine-tuning of read and write operations boosting system performance. There are a lot of "under the hood" changes in APFS, many of which will not be immediately apparent to users. In this first look at APFS implementation in High Sierra, AppleInsider examines the most obvious changes to users —boot times, file copies, and storage efficiency. For the APFS testing, we are using a 2015 i7 Retina MacBook Pro, and a 2012 quad-core i7 Mac mini with SSD. Both have 16GB of RAM. Prior to installation, both machines were running 10.12 Sierra. The MacBook Pro needed a re-install of High Sierra after the machine's EFI partition was corrupted for reasons unknown —but it hasn't happened since. APFS was previously restricted to non-boot devices. With High Sierra, that limitation has been lifted. Prior to installation, the PCI-E SSD on the MacBook Pro booted in about 24 seconds from a shut-down machine. Following installation, the boot time from "cold iron" was cut to 18 seconds —75 percent of the previous time. APFS has been in the works for several years, and available to macOS testers for data drives since the 2016 WWDC —so this isn't technically a new product. The results on the SATA-3 SSD in the Mac mini were more dramatic. A boot from a fully shut down state normally took about 42 seconds. Following High Sierra installation, boot times dropped to 64 percent of that in Sierra, taking only 27 seconds. Copying files is a little different on APFS drives. The new file system "clones" files, as opposed to a bit-by-bit copy when on the same drive. This is, in essence, a fancy alias. When the user alters the cloned file, only the changed blocks are saved to the drive. 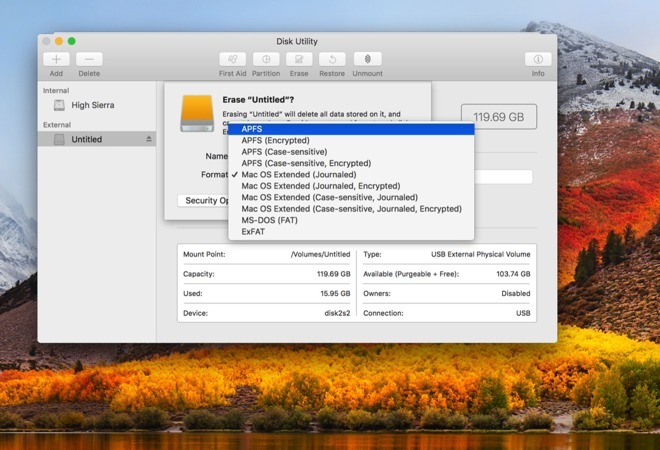 APFS is fully compatible with HFS-formatted disks. Copying files to or from an APFS drive is limited by the slowest link in the chain, be it the HFS drive, or the connection method. However, APFS to APFS copies across different drives removes some of the overhead associated with HFS, and can lead to some faster copies. Across a wired or wireless network, there is essentially no statistically significant change. Using the MacBook Pro and a Mushkin Ventura Ultra USB 3.0 SSD formatted with HFS, a 30 GB folder of 1250 MP3 files of varying sizes took four minutes and 51 seconds. When we reformatted the drive to APFS, the same copy took three minutes and 22 seconds. Copying fewer, larger files, the gains aren't as pronounced, saving only seconds per file. With iOS 10.3, users were sometimes seeing massive amounts of freed space as a result of the new file system, and the same appears to be the case. Prior to downloading the installer on our two test beds for High Sierra, the MacBook Pro had 222 GB used for the system, applications, and a large number of documents with nearly no duplications. The Mac mini had 64 GB full with very few documents. Following installation, the MacBook Pro shrunk to 202 GB used —nearly a 10 percent savings. The Mac mini had much smaller gains both in absolute size and as a percentage, with only 2 GB freed. That suggests that APFS is more efficient at storing smaller files, which our working documents tend to be. To further test the theory, the Mac mini was restored to the backup from Sierra, with our working documents moved over —but not the apps. Following the file transfer, but pre-High Sierra installation, the SSD on the Mac mini had 203 GB of data stored. After High Sierra installation, the Mac mini gained 19 GB of space, a similar result to the install on the MacBook Pro. AppleInsider expects that the savings experienced by each user depends on what kind of files they are, and the sizes of the files. 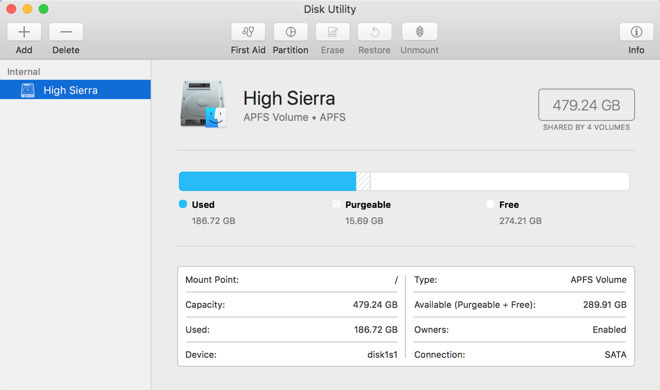 Also implemented with APFS is ability for APFS volumes to grow and shrink dynamically in a future version of High Sierra, so multiple partitions can expand and contract as needed automatically. At present, this must be done in the terminal. Snapshots can be saved, allowing for read-only copies of a file system for easy restoration. AppleInsider will examine more of these features at a later date. If you've got an older Mac with only a hard drive, it won't be converted by default. Additionally, some iMacs with 3TB Fusion drives and BootCamp may be "unsupported," according to Apple's release notes. Also, if you have a 2012 Mac Pro, you're out of luck for now. Apple notes that it will be included in an upcoming seed. AppleInsider will test with the 2012 Mac Pro when support is added. If you've formatted a storage volume for APFS, it will only mount on Sierra and High Sierra systems. Older versions of macOS and all versions of Windows won't be able to read the drives. There are some other sundry software bugs associated with APFS. Third-party utilities that hit the file system hard need to be updated with Carbon Copy Cloner already supporting the file system in its own beta. Microsoft Outlook won't load message bodies from an APFS volume —but that's up to Microsoft to fix. As a reminder, High Sierra, and all it encompasses,is in beta. Hammering out these bugs is why Apple runs these tests. That all said, APFS has been in the works for several years, and available to macOS testers for data drives since the 2016 WWDC —so this isn't technically a new product. Apple seamlessly migrated the iOS user base to it in iOS 10.3, so we're confident that this will go smooth when it ships in the fall.